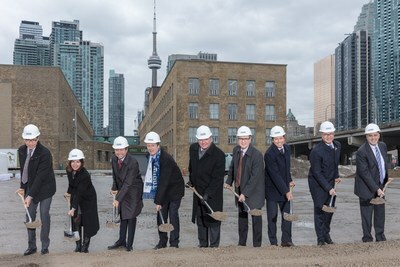 TORONTO, Jan. 11, 2018 /CNW/ - Menkes Developments Ltd. ("Menkes"), on behalf of a partnership comprised of Menkes, Greystone Managed Investments Inc. and Triovest Realty Advisors Inc., broke ground today on a new landmark office tower on the Toronto waterfront called 100 Queens Quay East. The office tower is the first phase of a vibrant new mixed-use community called Sugar Wharf, which will include employment, retail and residential uses, a new public elementary school and a new two-acre public park. The new Sugar Wharf community will be located on an 11.5-acre property, located at the northeast corner of Queens Quay East and Freeland Street, one block east of Yonge Street. This prominent location offers both the exciting lifestyle benefits of being on the waterfront, as well as convenient access to all the amenities of the downtown core, including Union Station and the Financial District, which are within a 10-minute walk. The Sugar Wharf development site was purchased by the Menkes partnership group in 2016. Currently, the Liquor Control Board of Ontario (LCBO) occupies three buildings on the property, a retail store, a four-storey office building and a warehouse facility. 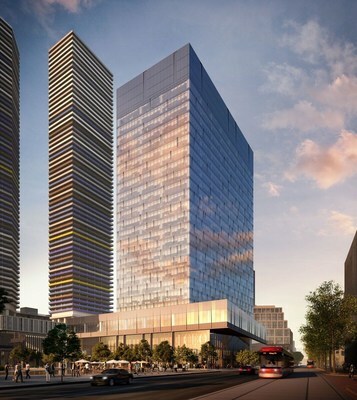 The new office tower at 100 Queens Quay East will be a 25-storey building, featuring approximately 690,000 square feet of Class "AAA" space. Designed by B+H Architects, the tower has been conceived with the objective of achieving the highest standards in environmental sustainability by striving for LEED Platinum certification. Leadership in Energy and Environmental Design ("LEED") is an internationally-accepted rating system that recognizes excellence in the design, construction and operation of green buildings. "Job growth in the corporate office sector is driving healthy demand for new, high-quality office space in downtown Toronto," said Peter Menkes, President of the Commercial / Industrial Division of Menkes. "Over the past decade, we have seen companies move back into the core, where the combination of amenities and proximity to the Union Station transit hub allows them to attract and retain top talent." LCBO will be a major tenant of the 100 Queens Quay East office tower, occupying approximately 225,000 square feet, or 33% of the building. The ground floor of the building will feature a 25,000 square foot flagship LCBO retail store, which will replace the current Queens Quay store. George Soleas, President & CEO of LCBO, said "The LCBO is proud of its 65-year history in Toronto's waterfront district and we look forward to our role in its future. This new development enables a revitalized work environment for our head office staff in a progressive building that not only demonstrates our organization's commitment to environmental sustainability, collaboration, engagement and wellness, but will facilitate a remarkable shopping experience for our customers in the Sugar Wharf community." In addition to the new office tower at 100 Queens Quay East, the master-planned Sugar Wharf community will include significant retail and residential components. There will be approximately 300,000 square feet of multi-level commercial retail space, including the new flagship LCBO store, as well as a new grocery store. The residential component of the community will include five condominium towers, varying in height from 64 to 90 storeys, and a mid-rise rental building. The development will also pay tribute to the previous historic uses on the lands by integrating key elements of the existing LCBO office building and warehouse into the project and the creation of a vibrant heritage mews. Working with the Toronto District School Board ("TDSB"), it is intended that a new public elementary school will also be incorporated into the community, serving the growing population of families with young children in the lower central Waterfront District. With plans to be located on the ground, 2nd and 3rd floors of the commercial podium, this will be the TDSB's first vertically-integrated school in the City. "Our goal with Sugar Wharf is to create a multi-dimensional, self-sufficient, 24/7 community that meets the diverse needs of the future population who will work, live and play here," said Alan Menkes, President of the High-Rise Residential Division of Menkes. "Toronto has a thriving downtown and people want to live here. We are seeing increasing demand for condominiums from all segments of the market, from first-time buyers, to families with children, to empty nesters." Sugar Wharf will be the largest mixed-use development on the Toronto waterfront, with between 4,000 and 4,500 people working in the community, plus a resident population ranging between 7,000 and 8,000 people upon completion. The Sugar Wharf community will be anchored by a two-acre park located on the north side of Queens Quay East, between Freeland and Cooper Streets. The northern boundary of the park block, which may incorporate complementary public and retail uses, will front onto a future extension of Harbour Street, which presently ends at Yonge Street. The new park is envisioned as an active use space that will serve both the new community, school and the larger downtown core population. The final design of the park will be subject to a design competition. "This new mixed-use community hub will provide new homes, a school, a public park, and help attract business and job opportunities. Investments like these help bolster Ontario's economy while providing convenience for consumers and improved quality of life for people," said Charles Sousa, Ontario Minister of Finance. "This development represents confidence in our city. I want to thank Menkes and partners for helping reimagine Toronto and build up the city," said Toronto Mayor John Tory. "Dynamic developments like this make Toronto attractive for jobs and investment and reaffirms why we're the best place in the world to live, work, play and invest." All buildings at Sugar Wharf will be connected to Toronto's weather-protected indoor PATH pedestrian system, when the PATH network is expanded east of Yonge Street in the future. "On behalf of our institutional clients, we view the Sugar Wharf development as a strategic, long-term investment in our national real estate portfolio. Greystone's real estate strategy is committed to the thesis of urbanization trends. Toronto's waterfront is a tremendous complement to this strategy," said Ted Welter, Managing Director and Chief Investment Officer, Alternative Investments, Greystone Managed Investments Inc.
Expected occupancy for the 100 Queens Quay East office tower is Spring 2021. Menkes Developments Ltd. is an award-winning, fully integrated, private real estate company involved in the construction, ownership and management of office, industrial, retail and residential properties. Founded in 1954, the company is one of the largest private developers in Canada, with a primary focus in the Greater Toronto Area. Menkes is known for its innovative, multi-disciplinary approach and particularly for its expertise in large-scale, mixed-use development. 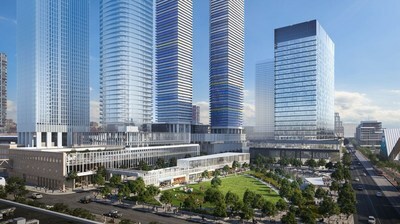 Past projects include the Empress Walk entertainment, shopping and residential complex in North York City Centre, the Four Seasons Hotel & Residences in Bloor-Yorkville and two landmark projects in Toronto's South Core district, 25 York (TELUS Harbour) office tower and the two million square foot Harbour Plaza Residences / One York commercial retail complex. Visit www.menkes.com for more information. Founded in 1988, Greystone Managed Investments Inc. is a privately owned, Canadian institutional investment manager. Employee-controlled, the firm is one of Canada's largest money managers (based on Top 40 Money Managers Report, Benefits Canada, November 2017) with C$33.6 billion of assets under management (as at December 31, 2017). Greystone is a multi-asset class manager with in-house expertise in fixed income, Canadian equities, U.S. equities, international equities, real estate, mortgages and infrastructure. Greystone is headquartered in Regina, with offices in Toronto, Winnipeg and Hong Kong. Visit www.greystone.ca for more information. Triovest is an entrepreneurial leader in institutional real estate creating sustainable places that enhance communities and enrich relationships. Its platform offers capital and advisory services with over $8 billion in assets under management and $4 billion in development. From offices in each major market across Canada, Triovest combines local intelligence with deep expertise to drive superior returns. Visit www.triovest.com for more information.